It's time for the first Telerik release of 2011, and I'm confident you won't be disappointed with the new things you'll find in today's bits. 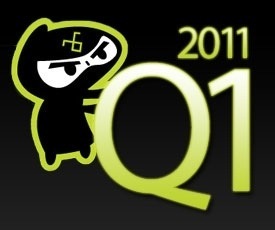 Q1 2011 is available today, delivering updates to 10 (10!) Telerik products. If you have a Telerik subscription (and really, you should with Telerik delivering 3 major releases every year), point your download managers at Telerik.com, start pulling the new bits, and then we can continue. I'll wait. RadControls for Windows Phone - With Q1, we are shipping the official v1 RadControls for WinPhone, which now include data visualization and a set of UI tools that have been built from scratch and heavily optimized for phone performance. To welcome the release, you can buy the RadControls for WinPhone (if you don't have a Premium or Ultimate bundle) for just $99! JustCode Decompiler - This feature is incredible (and fun!). In Q1, JustCode adds a built-in decompiling feature that makes it easy to browse to the source of any assembly just as easily as you go to definition for your own types. No more need for a separate program. No more need for losing focus or context. Just go to definition and decompile with JustCode. OpenAccess ORM Designer - OpenAccess ORM continues to evolve in Q1 with the goal of making the process of working with your data as easy as possible without taking away your options for optimization and configuration. To do that, we're shipping an all new designer that is more polished and more powerful; we're shipping a new Entity Framework converter to make it easy to move to OpenAccess; we're shipping an OpenAccess upgrade tool to help you move your old OpenAccess projects to new OpenAccess; and we're adding FULL (i.e. not Express) SQL Server support to OpenAccess ORM Free Edition! RadControls for Silverlight Tons of new controls come to Silverlight Q1, including new DataForm, DomainDataSource, Masked Input, and Spell Checker, plus major improvements in performance. RadControls for ASP.NET AJAX The AJAX controls also get new controls in Q1, such as the big new RadRibbonBar, and also add useful touch-and-drag support so all controls can work on mobile devices. RadControls for WinForms While WinForms may not be the newest technology in the .NET shed, we know you love it, use it, and want better tools for it. And Telerik continues to deliver in Q1, adding a new RadWizard control, Backstage view to RadRibbonBar, and full MSAA support to all RadControls for WinForms. RadControls for WPF Obviously, many of the updates for WPF are echos of what's new in Silverlight (shared code base), but uniquely new in Q1 is the official release of RadRichTextBox for WPF. If you've not checked this control out, you should. It does an incredible job of delivering a Word-like editing experience you can integrate in to your WPF app. And there is still more. The Telerik Extensions for ASP.NET MVC, Telerik Reporting, and JustMock are also being updated in Q1 with new controls/features/improvements. Huge release. Huge value. Q1 2011.